Thousands of salsa dancers and mambo maniacs from around the world will convene Aug. 28 to Sept. 5 as the 2016 New York International Salsa Congress takes over the city for a week of workshops, performances, tours of the Boogie Down Bronx and tributes to salsa legends. The Congress is in its 16th year, but its future was in doubt after operational problems in recent years and the previous organizer, John Choco Knight II, died in October. The trio formed a friendship taking classes at Dance On 2, a studio devoted to NYC-style salsa, and last year combined forces to buy, resurrect, rebrand and re-tool an event expected to draw at least 8,000 dancers and a dizzying array of Latin dance styles. The salsa summit this year features marquee performers – Jimmy Bosch, Adalberto Santiago, Roberto Ruena and Herman Olivera – and 50 dance workshops ranging from “Palladium Mambo Shines” and “The Essence of Sabor” to “Dips and Tricks” and cha cha, kizomba and bachata classes. A partnership with Bronx Salsa Fest offers pitorro and coquito tastings at the Port Morris Distillery, a visit to Casa Amadeo (NYC’s oldest Latin record store) and other stops in the borough that is associated worldwide with the percussive, anthemic back beat of NYC. 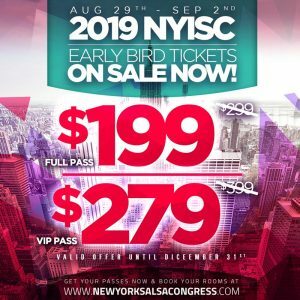 The popular local DJ “Mario B” (Mario J. Gonzalez) will serve as the main emcee for the event in new headquarters – The Marriott Marquis in Times Square. Parties and special events sponsored by Goya Foods and Festival People en Espanol are other new additions. “This is going to be a cultural event where people from all over the world can immerse themselves in salsa music, culture and history,” said Manny Villavicencio, noting that dancers from Japan, Ukraine, New Zealand, Australia and Croatia have already reserved rooms and passes. While salsa musicians may come from places other than NYC, such as Latin America, the Caribbean, and Africa, almost all cycle through NYC at some point to record (Fania Records, anyone?) and perform, explained Villavicencio, who has been collecting salsa music since childhood. “NYC is the mecca of salsa and gave salsa to the world,” he said. A “Remembering the Greats” tribute on Thursday night Sept. 1 will combine the music of recently deceased salseros such as Wayne Gorbea, Ismael Quintana and Raphy Leavitt with children dancing to their music in choreographed performances, their little shoes carrying the dancing the giant achievements of the past into the future. Overflow problems in the past have caused ill will: This year, ticket sales will be capped to conform with fire safety regulations and various event capacities, so advance tickets (passes range in price from $199 to $399) are recommended. Some familiar features, such as “The Diva Challenge” remain: This year, dancer-choreographer Griselle Ponce teaches female participants a choreographed salsa performance over three successive days with this year’s routine performed by participants for the crowd on Sunday, Sept. 4. There are also new “value added” features: Vilma Villavicencio worked with NYC & Company to provide “a delegate discount pass” to attendees for local attractions and eateries, a customized map showing locations of associated events and an official welcome letter from Mayor Bill De Blasio. Vilma also wrangled a Broadway dance class out of Maria Torres, the associate choreographer for “On Your Feet,” the musical about Gloria and Emilio Estefan, and discounted seats to the Broadway show. “It made natural sense because the show is in the Marriott Marquis Theatre,” where most of the events will take place and foreign dancers are staying, she explained. Vilma Villavicencio noted that while she, her husband and Guerrero are committed to making the Congress a smooth professional endeavor, it is also a labor of love from a trio that not only loves salsa music, but represents a sizeable segment of NYC’s Latin world: Her parents are from El Salvador, her husband is half Puerto Rican and half Ecuadorian and Guerrero is of Dominican descent. “The Latin-ness lives us! It’s in our souls!” she said.